After a hairy few minutes wrestling with the world's smallest turkey, the creature has been stuffed, trussed up and put in the oven. If there is such a thing as the runt of the flock, then we've got it. It was the turkey at the back, the one that came last when the birds scurried across the village road to avoid a passing scooter rider with a grown-out Mohican haircut. It was the cougher, the wheezer, pigeon rather than barrel chested and if it could speak it would have had a high-pitched voice like the comedian Joe Pasquale. Still, with Delia's chestnut and apple stuffing and an assortment of vegetables around it, Lefteris the turkey might just make the grade. It cost an arm and a leg, so it had better be good. No wonder villagers call Spiros the turkey man the Roman Abramovich of Kerkyra. 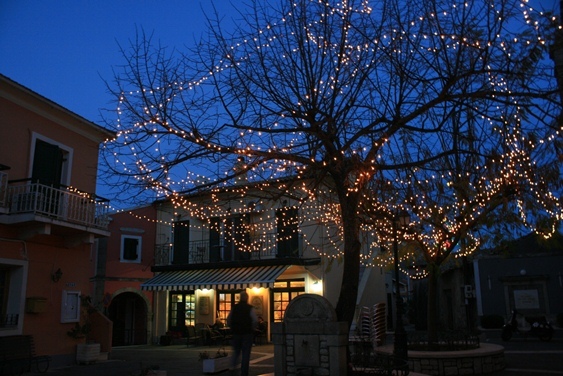 We are having our Christmas meal this evening, a break with tradition but we wanted to get on up to the village square tomorrow where, for our favourite taverna and kafenion, it will be business as usual after an early-morning service in the Greek Orthodox church. 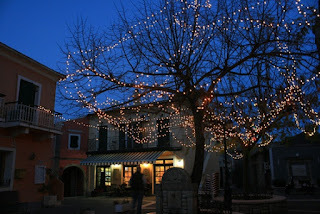 So from Agios Magikades, here's wishing you a very merry Christmas where ever you are. Καλά Χριστούγεννα. Ah, Maddie Grigg!! Merry Christmas to you from Texas!! I have so enjoyed dropping into your world this year! What a life you are living! Thanks for allowing us to join in on your adventures! They're pretty much bigger than ordinary chicken. Please Mr Postman, is there a letter for me?